These four cards are among the very first cards I made when I began paper crafting. I love the simplicity of black and white, as it doesn't require lots of crazy ink colors to make a pretty card. Each of these cards was made using a 65 lb. cardstock base made from the Recollections brand found at Michaels. I cut the 8.5" by 11" paper into two equal 4.25" by 5.5" sections and scored it down the center with my Martha Stewart mini score board. 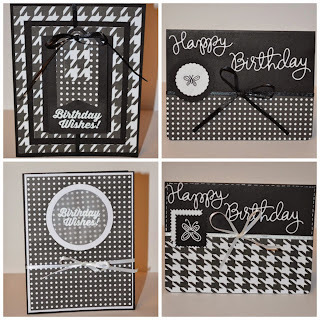 Once the bases were created, I used black and white houndstooth and polka dot scrapbooking papers I found at Hobby Lobby. I also used vellum in the card with the circular window. For the stamped sentiments, I used the Simon Says Stamp Birthday Sentiments set and coordinating die. The butterflies used came from a Hero Arts friends themed clear stamp set and from Lawn Fawn's Blissful Botanicals set. As for die-cutting, I pulled from many different die sets. I used circle and scalloped circle sets from Sizzix, the Gift Tags die set from Avery Elle, and the postage stamp sized die from Momenta. The postage stamp Cut and Emboss Die Set from Momenta was a frugal find from my local Tuesday Morning. That store is a great place to find cheap craft supplies! I am a huge fan of using Offray ribbon because it is shiny and very inexpensive. Unfortunately, these cards have been sitting in my card organizer, and the bows have become a little warped since I put them in there. Black and white cards are frugal cards to make, in a sense. One black ink pad can go a very long way! I like not having to worry about buying a colored ink pad and card stock to match it perfectly. My favorite black ink is the Versafine onyx black ink. It stamps very crisp and sharp images. I did choose to emboss on two of these cards because I have found it very difficult to find a great white ink. I know some people really love the Unicorn Pigment Ink from Hero Arts, but I have yet to try it. Instead, I used my Versamark ink and Ivory embossing powder from the Recollections brand. Links for many of products I have mentioned will be provided below. 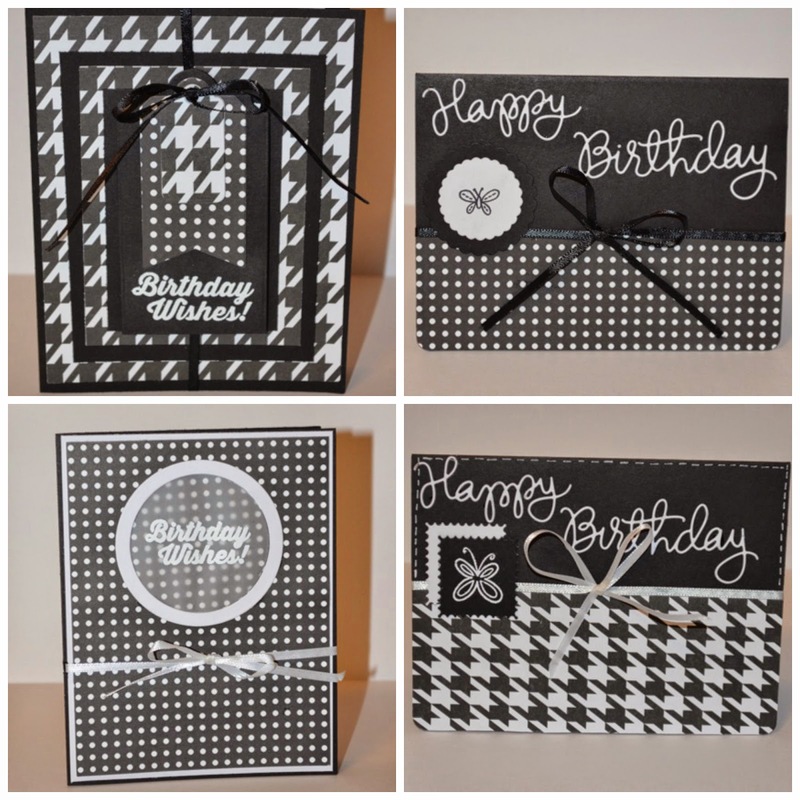 Thank you for checking out these simple black and white birthday cards! I appreciate you taking the time to read my blog!